This year we had three new compares and hosts for the evening. Former BTC racer and ITV 4 pundit Paul O’Neill, former Scottish FF star Joe Tanner, and former Mini Cooper lady racer Fiona Wallace. Both Joe and Fiona are closely involved with the SMRC You Tube TV programmes. Paul is a talented presenter, and from what we saw the Liverpudlian could also earn a living as a stand up comedian. Jim Clark foundation representatives were in attendance, and everyone a chance to enter a draw to win a Lotus Evora to support the trust. 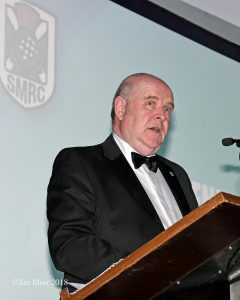 Paul O’Neil said it was a night for SMRC Champions. We then had the SMRC 2018 Champions parade, as they entered the room to applause. The dinners then watched a recorded message from Club President Allan McNish. Allan said he was sorry that he couldn’t be here, but he was in Shanghai. He said there was fantastic racing and hard competition in SMRC championships. Allan noted the club has to evolve both on and off the track. The Citroen C1 Cup initiative, and appointing Rory Bryant (the clubs new Business Development Manager) will bring a new dynamism. Allan said he hope we have had a fantastic season and will have a fabulous evening. 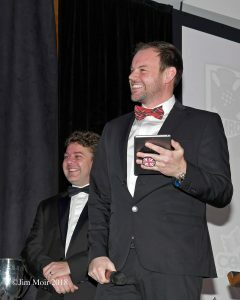 Allan had mentioned Ryan Dalziel, but Paul O’Brien told the audience that Ryan was stuck in New York , so wouldn’t make his annual and most welcome appearance at our dinner. Now onto the Scottish Motor Racing Club 2018 dinner and awards evening, with our season behind us. We are here this evening to celebrate the winners and achievers and all who took part, and also to acknowledge the volunteers and officials, especially Steve Burns in his new role as Competitions Director, and all who have contributed in whatever way in allowing our wonderful activities to take place, also the directors who have contributed, and finally my long serving wife for putting up with it all. Key to our ability to exist is our relationship with the venue, can i on behalf of you all thank Jillian and her team at Knockhill for all they do every season, thanks very much, and a last minute call off from Ryan Dalziel who has been held up. I am sure we are in for a great evening, in the hands of the BTCC star Paul O’Neil and our very own Fiona Wallace and Joe Tanner. Firstly, it is my duty to convey apologies, we have already heard from our president Allan McNish, Dario Francitti, Paul di Resta and John Cleland, also David Coulthard and Bernard Buss and also Ryan Dalziel, who has been stranded on route. 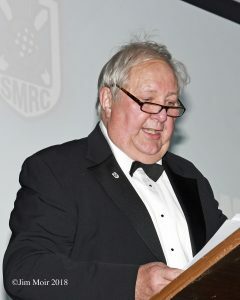 We are going to miss our good friend club and MSA steward Ken Laidlaw, as Ken passed away earlier this year after a long and dignified battle with is illness, he will be missed by us all, but also the hillclimb fraternity all over Britain where he was heavily involved. I am delighted to welcome guests and partners here this evening, long standing commercial partners Yokohama, represented by Mark Evans, head of motorsport. Mark thank you for your support again. Mark and I are delighted to say we have already concluded the deal for 2019, it is greatly appreciated, and also welcome to Ronnie and Daisy from Wheels Around who help in making the relationship so successful. Welcome to Sandy Burgess CEO of the SMTA, having backed the hot hatches this year and enjoyed the involvement, we are delighted to announce he will be our principal partner with our new Citroen C1 championship, we will be working together to create pathways with students on this project, and there will be more news to come on this front. 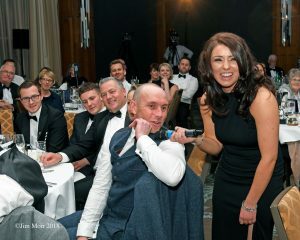 Sadly, our other long term and highly valued partner in supporting our Minis, Tommy Dreelan of Celtic Speed cannot be with us this, the screen behind me shows that Tommy is not only busy elsewhere, but also being very successful, well done. I’m delighted to see BTCC drivers independents hero Rory Butcher, and race winner Aiden Moffat with us this evening, and a big mentioned for Colin Noble jnr, who along with Alasdair McCaig have performed with such success representing Ecurie Ecosse in European Le Mans cup, and finishing as vice champions . Delighted to welcome David Treymanne here again this year, if there is better motor racing author out there I would like to meet them, obviously other than our old and dear friend Graham Gauld, if you have not bought Davids’ Jim Clark book entitled, ‘The best of the best ‘ then please speak to him tonight and do, it is fantastic. As you will have seen Jonathan Gilbert of the Edinburgh Watch Company is with us this evening. Jonathan welcome and thank you for kindly sponsored our pre-dinner drinks event, we really appreciate this. Especially as an ex competitor, a keen enthusiast, Jonathan can be seen at many motor sport events, with his expanding watch business, which is a testimony to his quality and commitment, please look closely at what he has to offer here this evening. We would also like to welcome patrons partners supporters and friends of the Jim Clark trust here this evening as our charitable partners, it is so very fitting in this the 50th year of his passing, they will be with us on stage later for a chat and a special presentation. And final note of thanks, but the most important. To the creator and purveyor of the pies, Walter Robertson. Regarding filming, may I say for there first year I believe the Edinburgh college team led by Marjory , Jim and Pavel have done a great job, obviously a massive learning curve for them. Ii am delighted to say they have invested in some new technology to assist with editing, and we have plans to have you all contribute in how improvements can be made for 2019, Marjory and her team, thank you all. I am delighted this evening to announce more important initiatives and hugely important changes for 2019. Tonight, I can tell you it now works for all from race one. We have also created a new volunteer marshals group. This will be called the Scottish motorsport support team, we will assist with some match funding and be providing a meeting room fully paid for 3 meetings per year, this is being led by Gordon Melville. If anyone here thinks they can help in any please contact Gordon who is with us tonight, good luck Gordon. Our new Citroen C1 championship, a cheap and highly affordable route into motor racing for anyone, and we are intending to bring you exciting developments here with educational partnerships, and disability motorsport, more to come, 8 registrations already in. Obviously you are aware of the John Romanes legacy, as stated earlier in the year, the process of dealing with this challenging yet welcome donation to the club is underway, and first traunch of funding has been received in the last few days. We are in the process of handling the remaining parts and will make announcements as these are concluded with. But our biggest and most important new change going forward, is the appointment of Rory Bryant as our Business Development Manager. Rory has proved to be very successful in his current role with SMS, having worked with him on this project for 5 years. I have every confidence he will bring these talents and vast knowledge to us , it is major step for us, I have received congratulations and from Allan McNish, Tom Purves his current chairman, and many others within UK motorsport including our newly renamed governing body on this ambitious and necessary development, I shall invite Rory to come up here in a few minutes to say a few words. Today marks the start of an ambitious journey for the SMRC as it transitions from being a traditional facilitating club, into a modern membership based focused organisation. This signals a shift in the clubs emphasis putting the promotion of the sport and membership service at the forefront of its mission, this represents a fundamental repurposing of the organisation as it seeks to grow as a club and sport. It has been a hard year, but after appraising where we were and the pathway we had to follow, tough decisions have been taken, a great deal of hard work has been put in. I can assure you that we will have accurate budgeting in place, and the creation of a targeted four year plan. It does not stop here however, the next phases on moving up the grid will become clear as the months go by, there are lots of initiatives in the pipeline, all calculated to increase participation and the needs of our competitors, members, volunteers, customers, officials and stakeholders. Our goal will serve to organize and measure the best of our energies and skills, this is the challenge we are willing to accept and we intend to win. This club is moving forward, with a new and reinforced confidence for the future of Scottish motorsport, and it all starts here now. 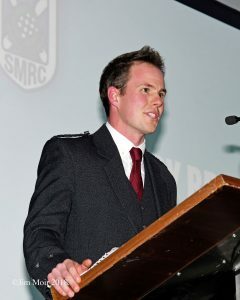 Rory said it was a huge honour to be appointed, and thanked Sandy Denham and the SMRC for his appointment. He said he’d been fortunate to work in motorsport for the last few years and that it was now an honour to work for the club. .‘I started my own motorsport career with SMRC’, said Rory. He noted that he starts his new job with the clu in January. He said his goal was to make the experience much better, increase grids in all classes, work with Knockhill, increase spectators, improve benefits packages the club offers. ‘I want views and opinions and I contacted Racing members with a survey and half have replied already’. He went on to say that he intends to speak to competitors over the next few months to get a real understanding of what they want. Rory noted he’d be progressing a partnership with Edinburgh Watch Company and they’d be the official timing sponsors next season, and Rory thanked Jonathan Gilbert of Edinburgh Watch Company. Rory then said, ‘ I’d like to echo Sandy’s sentiments on John Romanes, and we’ll be investing in the club over the coming years’. He noted that he’d raced with many of the members and that if he didn’t know anyone, he’d be in the bar after the ceremony to meet members. Rory then congratulated all the winners. Allan McNish said ‘ its been 10 years since I’ve taken over the Presidency and I feel its time to hand the reigns onto the next president, Hugh McCaig. 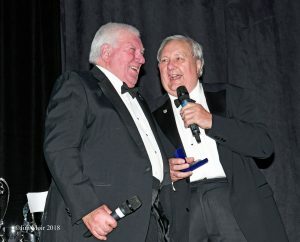 He has done an enormous amount for the club as Chairman, committee member, reviving Ecurie Ecosse and the unending support you’ve given us all. I know how much the club means to you and I think you will be perfect as the next President of SMRC’. Sandy Burgess from SMTA was on stage to present the awards. 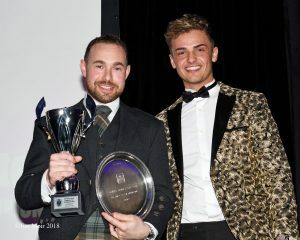 Chris Milford the new Hot Hatch Champion said on stage to Joe Tanner that ‘ I’ll keep my options open , motor racing is a strange thing, you are always trying to find money, but if you want some good racing then its Scottish Fiestas’. Wayne Macaulay the Fiesta ST Champion wasn’t present. 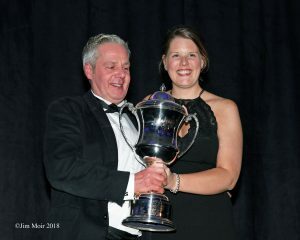 Fiona interviewed David Hunter saying, ‘ its your 10th season in Legends and you’ve been runner up twice’, David said, ‘ Its taken a lot of effort and a lot of work . We had a good run early in the season and its been good’. Joe Tanner first spoke to Rory Butcher on stage, saying your career started in Formula Ford (2007). 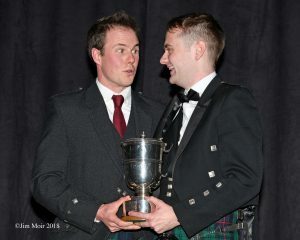 Joe said it was in 2009 in the Scottish Championship when Rory was Champion and Joe said he was runner up to Rory that year, (Rory also won the Kent engine class at the FF festival in 2009 and raced FF nationally). They joked about how close it had been in Scotland. 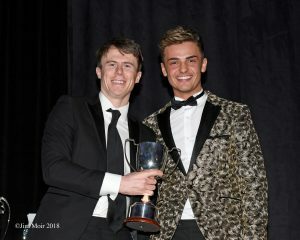 2018 Champion Ross Martin then came on stage for his award. He received several trophies and Joe Tanner said this sums up your season coming with all the wins. Ross though staying in Formula Ford would be nice and that the nationals were good. Joe then asked about the Mazda Road to Indy competition which Ross had won the Scottish ticket to for the 2nd year in a row. Ross said, ‘ There’s a lot of British guys going over there and were going t a track I’ve never been to and driving a car I’ve not driven before, but I’ll give it a good shot’. Fiona Wallace then interviewed Ross’s mechanic in the audience, Sandy Forrest , who was a former Scottish saloon and FF racer of note. Sandy said, ‘ I’ve been lucky enough t deal with a lot of young drivers when I worked at Knockhill and Ross is the most talented . I tried to be quick when I raced but he’s younger, faster and far better than me’. Alistair Baptie the new champion was interviewed by Joe Tanner, who said you were last year’s champion and here you are doing it again. Alistair said, ‘ you’ve got to try your best and put on a good show for everyone. But you need such a team behind you as well. I’m just a guy who started and tried not to embarrass myself’. Sandy was a former top XR2 racer in his day. 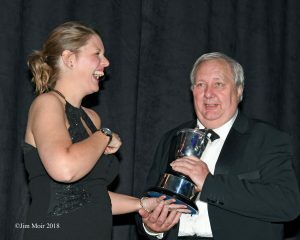 Sandy spoke about the trophy which is awarded to the XR2 Champion, which is the Sandy Forrest trophy. He said ‘ it was first awarded to the club in 1977 for 1 litre GT class cars’ and his dad (legendary Scottish racer Ian Forrest) was the first winner. Sandy noted that he himself won it in 1998 for the XR2 Championship. Compare Paul O’Brien said when he was here with BTC in 2013 the BTC drivers were hanging over the pit wall to watch the Minis racing. Mark Evans from Yokohama Tyres who support the Cup came up on stage to present the awards. 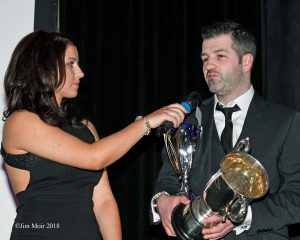 John Duncan took the winners trophy and was interviewed by Fiona Wallace. She said, ‘John Duncan 2018 champion’ and the audience cheered loudly. John then said, ‘ what a season, we entered the Mini Championship for fun, and to come out three years later as champion is unbelievable’. 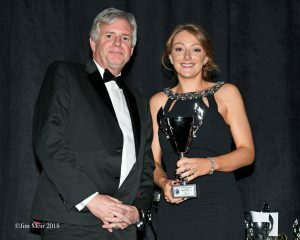 Saloons award presented by Rory Bryant to mechanics of Mini Cooper racer Ashleigh Morris. Single seater award to Ross Martin’s mechanics. SMRC Chairman Sandy Denham said how delighted we were to have the Jim Clark Trust as our partners, and that there could be no more fitting partners as its 50 years since Jim’s passing. Sandy noted, ‘ SMRC created 250 medals to celebrate Jim Clark and we donated club medal no. 1 to the Jim Clark Trust’. Onto the stage came former top drivers Doug Niven and Andrew Cowan, as well as Chairman of Trust Ben Smith. Sandy asked Doug about the Trust’s project. Doug said that a quick resume was he’d been a trustee for many years, and that in 2012 we informed the local council (in Duns) we wished to revamp the museum. We thought it would be £700,000 to £1 million, but this grew to £1.65 million. With Heritage lottery monies matching trust funding, this saw people from across the world donating to the project. We started the rebuild 2 months ago (September) and the new museum should be ready in May/June next year (2019). In the past only the trophies were displayed, so phase 2 will add cars. He added that we are now in the process of looking for another £1 million to get cars. Doug then thanked Knockhill , Hugh McCaig, Allan McNish, Sir Jackie Stewart and many others for their help. Doug noted that the legacy of Jim goes on and on. Doug then thanked Sandy Denham and everyone who has made this all possible, and said he looked forward to seeing everyone in Duns. Hugh said he would have a few words with former international Rally star Andrew Cowan, noting he spills wine all over him. 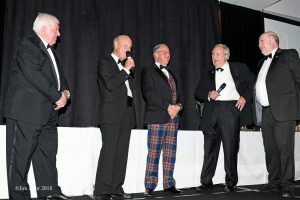 Hugh said ‘ Andrew is a great supporter of Scottish Motorsport’, Hugh reminisced that in his youth he went for lunch at the MacRobert pavilion at Ingliston and there was Andrew Cowan. Hugh then spoke about the new Jim Clark room. Andrew said, thank you to Sandy and Hugh , ‘I was looking at some old photos and its wonderful how its been kept going and all the spirit it has. I wish you all the very best of luck’. Andrew said that Jim was a mate of mine and we got up to some naughty things (there was lots of laughter as Hugh said go on tell us). Andrew then said, how great it was that the club was so healthy. Doug Niven (Jim Clark’s cousin) thanked everyone and wished Hugh all success in his presidency. He than said, ‘ 50 years ago Duns council were looking for £4,000 to get a building to put Jim Clark’s trophies in, look were we are now’. 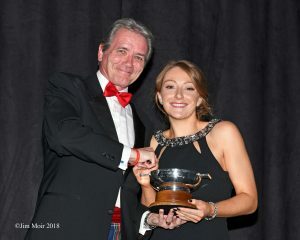 Presented by Gordon Melville to Mini Cooper Cup racer Hannah Chapman. 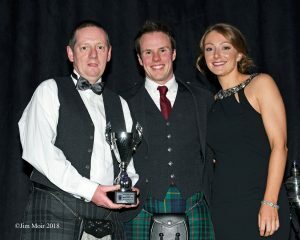 This award was voted for by the Knockhill marshals. 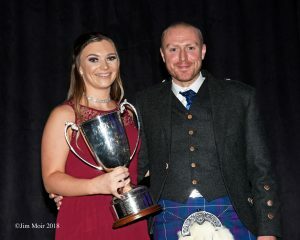 Author and motorsport journalist David Tremayne presented the award to Ashleigh Morris, who won the Scottish Mini Cooper Ladies Cup. This carriage clock is given to the winner to keep and is awarded to someone who puts a huge amount of effort in to the sport, but does it entirely for the fun and enjoyment. Presented by Walter Robertson to Glen Alcock. Who won more races in 2018 than any other club driver. 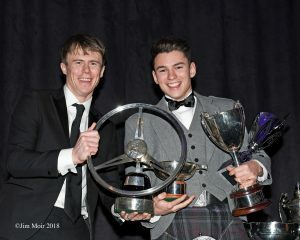 Awarded to BTC racer Rory Butcher and presented by BTCC racer Aiden Moffat. Sandy said, ‘ I like saloon car racing, and I’m always taken by someone in not the best car, and then drags it into the top 10, and ten times. So it is awarded to Rory Butcher. Sandy went on to say ‘ Its very important for us to see people who started with SMRC go on to race further. Sandy then said here we have an example of two great drivers going on to success, and I applaud them for what they’ve done. Aiden Moffat and Rory Butcher. He asked Aiden about his year, saying how difficult is it? Aiden said, ‘BTC is a very close championship, there’s so many factors, the need for a good car, engineers, mechanics, and everyone does a fantastic job to get a win. To bounce back from a low mid season and win was special. Just watch on TV how everyone wants to kill you on track. Someone sideswipes you on a straight then says didn’t know we touched’. Aiden also noted that Rory did well with the MG. This trophy is given in memory of Duncan who competed at Ingliston in the 70’s and 80’s and is awarded to an enthusiast who is totally committed to his favourite sport of motor racing, and invariably does most of his work behind the scenes. His or her efforts are usually seen by few but appreciated by many. Won by Steve McCall, Scottish Legends Cars Championship and presented by Carol Brown. 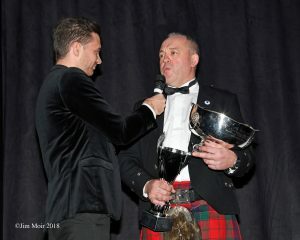 New President Hugh McCaig was on stage to present the Ecurie Ecosse Hub Cap to this year’s winner. The wheel spinner from an Ecurie Ecosse Jaguar D-type, affectionately known as the ‘Hub Cap’, is presented each year to an outstanding young Scottish driver who has shown enormous potential. 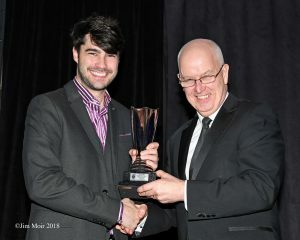 The Trophy was presented to Formula Ford racer Seb Melrose. Hugh said, ‘its a difficult one, a lot of people could have won it this year. 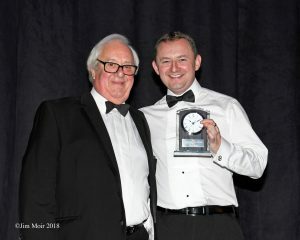 I decided to do something different and award it to someone whose has done a lot for motorsport in Scotland, UK and raced elsewhere. Even if he fell off he comes out of the car smiling. He reminded me of my great pal Innes Ireland. ‘ Hug than said to Seb, ‘ your grandfather and family are great supporters of you and its about the way you present yourself’. Seb said, ‘ thank you, this means a lot to me’. The Sheila and Hartley Whyte trophies originally come from the Whyte & Mackay Trust. 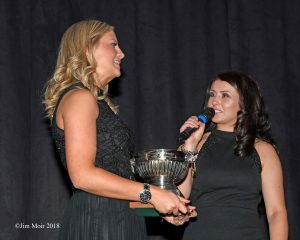 Fiona said that the 2 awards are given to outstanding drivers competing in SMRC events. 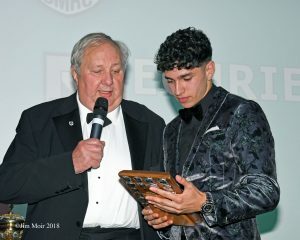 Rory Butcher presented the awards. This award goes to the top Scottish Driver competing in an International Championship. 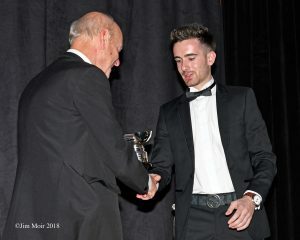 Presented by Doug Niven to Colin Noble jnr, driver for Ecurie Ecosse. Colin said, ‘this is a very nice award and its an honour to receive it. Its really been a strong year and I’ve been with the same team for the last 2 years, and will be staying there next year. This beautiful trophy was donated to the Club some years ago by Doris Romanes in memory of her late husband, John, who was a stalwart of the Club for the best part of 50 years, and ran Ingliston in its early days. 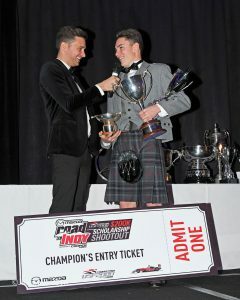 The trophy is awarded to a Scot for ‘Excellence in Motor Racing’. Previous winners include David Leslie , David Coulthard, Paul Di Resta in 2016 and Gordon Shedden in 2017. 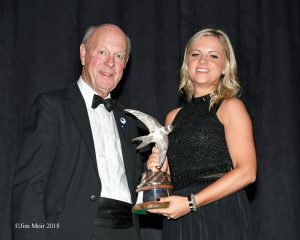 Won in 2018 by Jonny Adam and Doug Niven presented it to Rachel Brunton on his behalf. Paul O’Neil who had been a real star as the evenings main compare thanked everyone, and Joe Tanner said Paul has done a stella job. He was warmly applauded by everyone in the room as the nights formal proceedings came to and end. Paul said, ‘you’ve been great people’. 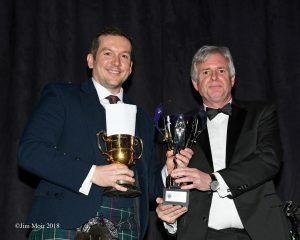 The presenters were ably assisted on stage during the evening with the trophies, by Steve Burns and Mike How.